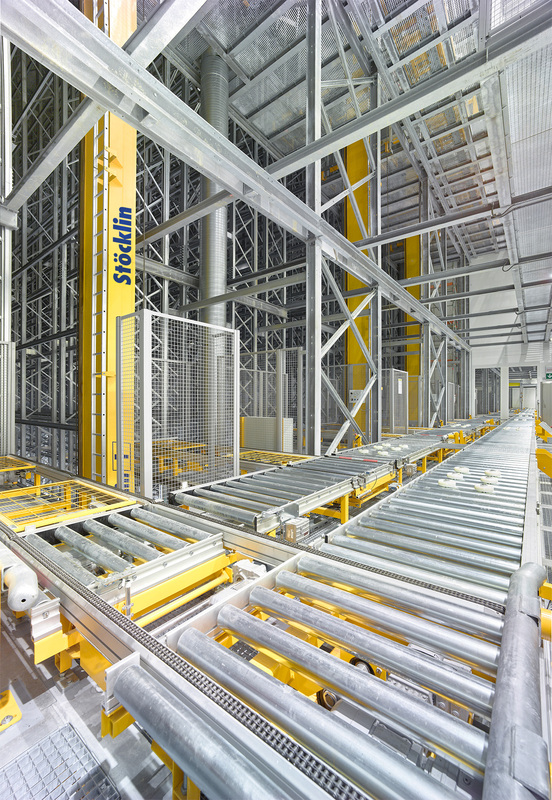 Precisely arranged surroundings for maximum performance – Stöcklin Logistik AG. Förder- und Lagertechnik. Galliker Transport’s origins reach far back to the year 1918. At that time they initially used horses and carriages for their first transport operations hauling wood and feed. In the course of time the company, still owned by the family, developed into an internationally active logistics service provider, occupying a position among the top 10 Swiss companies in this branch. Currently Galliker is represented in six countries with approximately 2,760 employees. The headquarters and simultaneously cardinal point for all national and international service sectors is Altishofen in Luzern, Switzerland - from the point of view of distribution ideally located directly on Highway A2 and the Gotthard railroad line. 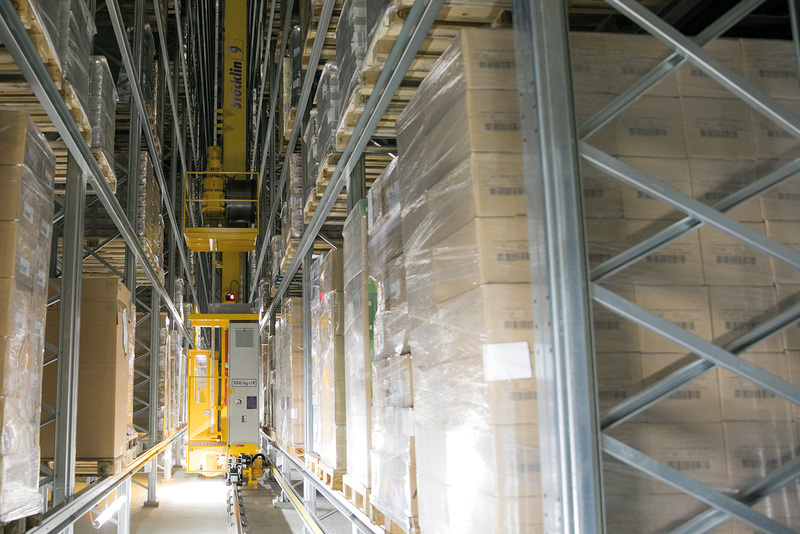 Under the slogan “The next step in logistics” Galliker successfully uses its global network of branch offices for handling orders in various temperature zones. The continuous cooling chain covers the entire process from the time the sensitive goods are picked through production, including storage and picking right up to final shipment. Auxiliary services tuned to individual customer requirements in the areas of customizing and picking complete the finely adjusted offer. Phase 1, completed in October 2015, focused on erecting a 28 m high, fully automatic high bay warehouse for deep freeze storage (TK-HRL) with 9,200 pallet storage spaces, kept at a frosty ambient temperature of minus 26 degrees Celsius. Examples of the type of goods kept in storage are ice cream, pizza, convenience food and baked goods. 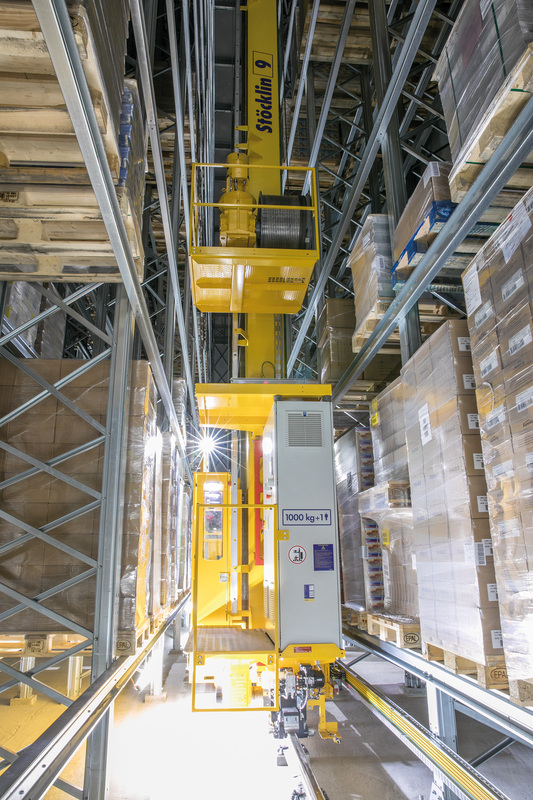 Four stacker cranes (RBG’s) from Stöcklin’s proven MASTer series transport the goods in the 4-aisle TK-HRL. 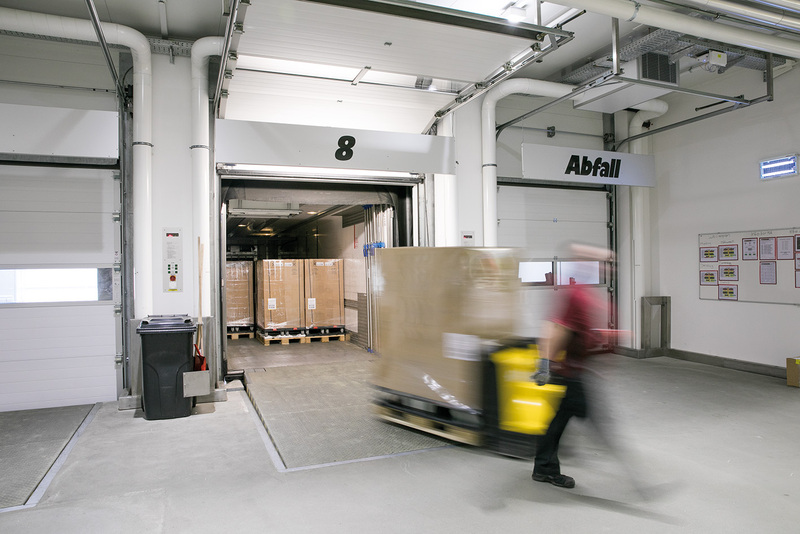 Moreover the Swiss intralogistics system provider was responsible for supply and installation of the entire conveying equipment including distribution carriages, hoisting equipment and elevators. 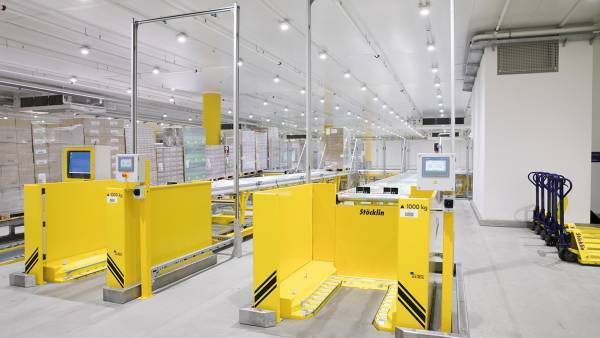 The scope also included implementation of a comprehensive fire and labor safety concept as well as connection of a new material flow computer (MFR) to the existing warehouse management and control system. 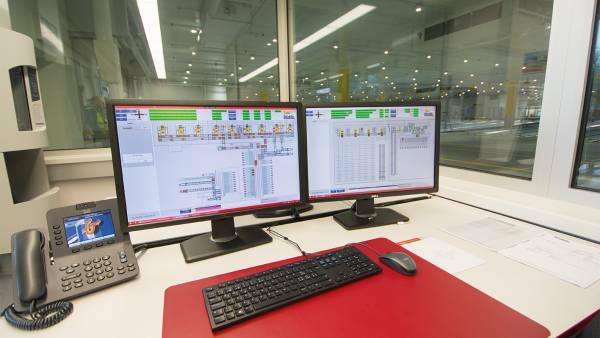 Integrated into the MFR are an intelligent energy management system for the stacker cranes as well as system visualization equipment allowing realtime review. The Stöcklin WinCC program reflects the operating state of the system, offering details right down to the actuator and sensor level, thus allowing problems to be localized precisely and remedied immediately on site. 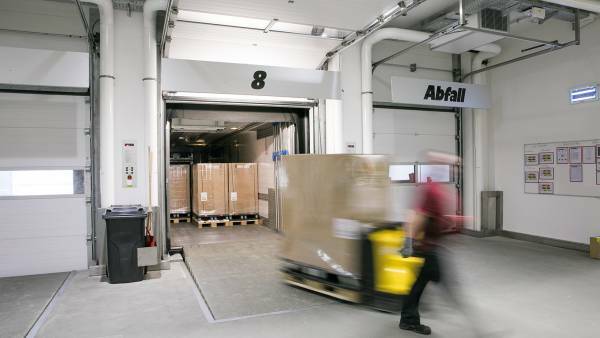 “In 2015 we took the first step toward providing the prerequisites to adequately satisfy the increasing demand for specific logistic services in the deep freeze segment today as well as in the future”, said Martin Hofer, Logistics Manager at Galliker. “The next construction phase, following immediately thereafter, was associated with the strategic objective of also realizing this in the fresh and ambient temperature sector.” This background clearly defined the central requirements for the overall package to be implemented successively. Maximum quality and safety at the technological and process level, as well as product protection without compromises, ensure that the highly sensitive goods are not damaged or, in the worst case, even completely spoiled. 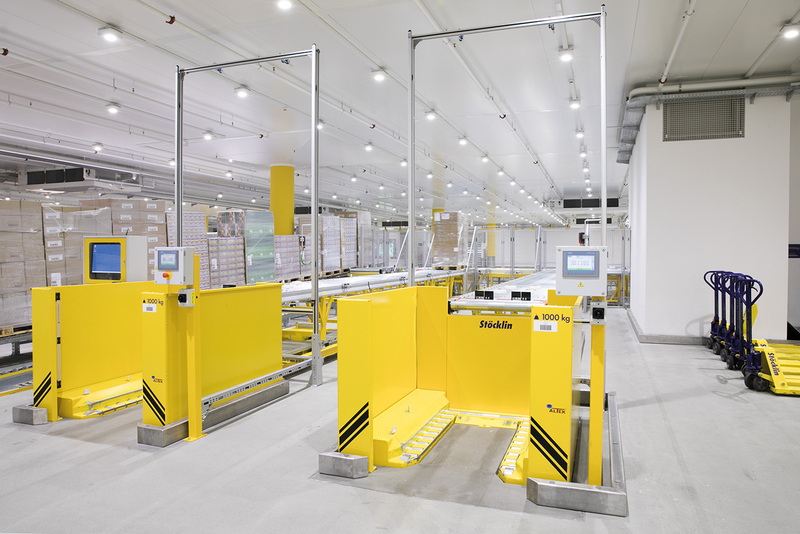 Final completion of Logistics Center 4 (LC4) required only 24 months and has allowed the new Galliker Competency Center for Food & Healthcare Logistics to reach full maturity. 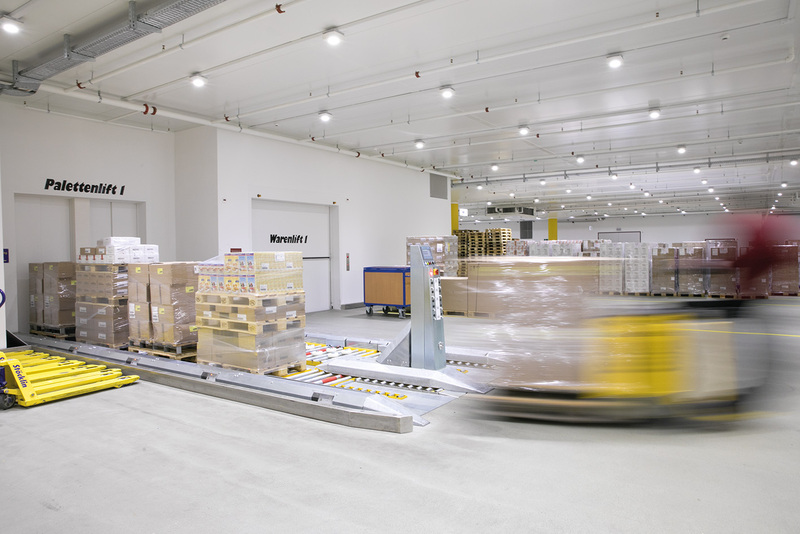 The heart of this over 19,000 m² large, complete facility for storage and handling of food and healthcare products consists of two, fully automatic high bay warehouses. 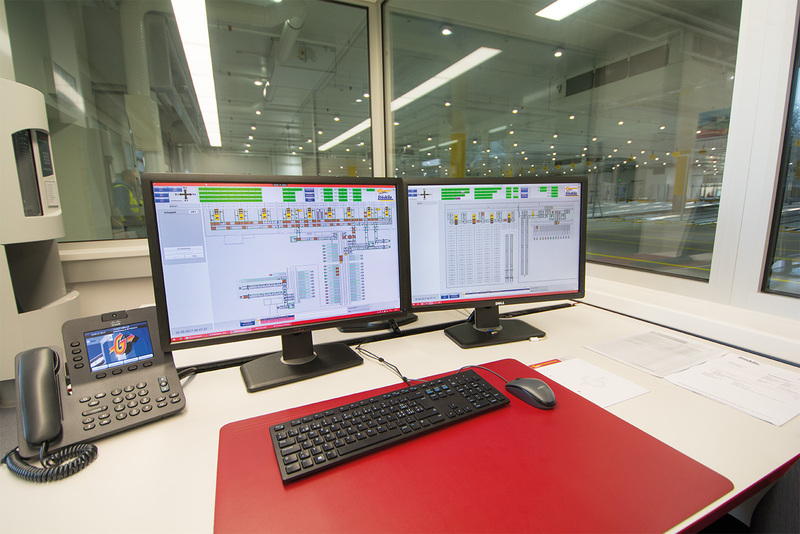 In addition to the TK-HRL with its four RBG’s, nine additional, fully automatic machines serve the temperature zones between +10°C and +18°C. Considered from the exterior, this high bay warehouse for ambient temperature and deep freeze storage, erected at an altitude of approximately 500 meters in the heart of Switzerland, is certainly an impressing structure. But the interior is equally surprising: A carefully and systematically planned structure consisting of numerous horizontal and vertical conveying paths with definitely futuristic traits. Moreover the subject of climate and environmental protection was given due consideration: The entire logistics center is completely autonomous in terms of its thermal technology, thus setting new standards for energy efficiency and sustainability. “The scope of goods and services to be provided by Stöcklin in Phase 2, coincided with that realized previously,” emphasized Ivan Jovanovic, responsible Project Manager at Stöcklin. However there is one eminent difference - regarding the dimensions in consideration of the additional, enormous increase in capacity. 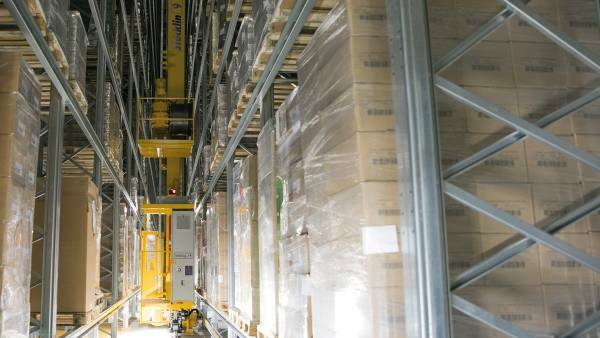 The newly equipped 26,136 pallet storage spaces serve for stocking dry goods such as chocolate, pasta, grain products and canned goods at ambient temperatures of +10oC to +18oC. The associated volume of goods to be handled dictated the intralogistics components to be integrated. Thus nine MASTer stacker cranes, each equipped with telescopic forks, operate in nine aisles with a clear height of approx. 26 m in the new high bay warehouse, which is also completely fenced. 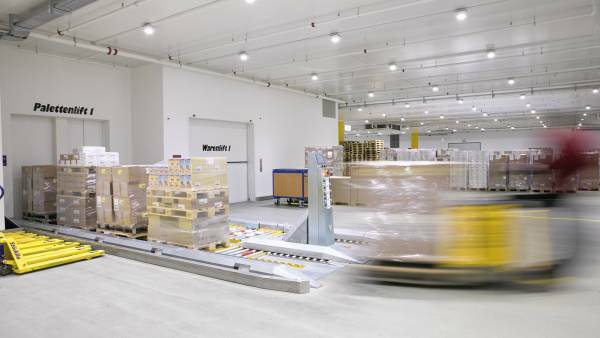 These vehicles pick up pallets from the branch lines on the ground floor and move them to the storage area. Goods to be retrieved also travel over the branch lines to the picking station. Pallets are returned in an analog fashion. Maximum operating speeds of up to 2.5 m/s and elevating speeds of up to 0.63 m/s are possible. 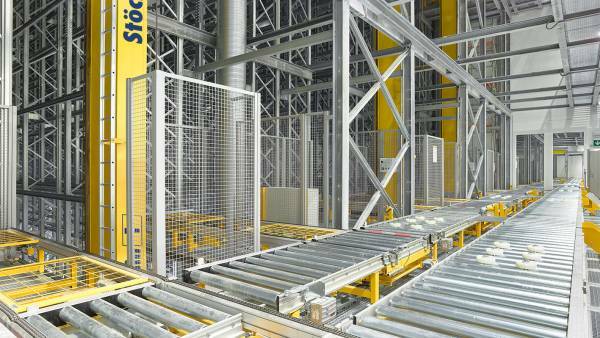 Further central components include the conveying system for storage and retrieval, shuttle cars, cable hoists, pallet labeling systems and quick-opening doors. The conveying equipment installed includes roller as well as chain conveyors for transporting the pallets securely to their destination at a rate of 0.3 m/s. A so-called cyclic conveyor is also integrated. Cyclic conveyors are multiple station conveyors which transport the pallets to the pallet location and are stopped by the cycling switch. The chain conveyor is restarted by the next pallet. 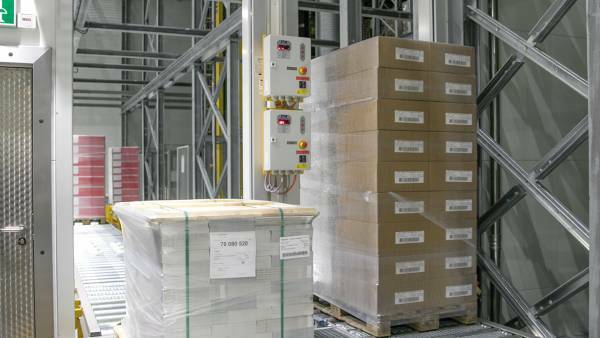 During this process the two load carriers are transported until the second pallet reaches the cycling switch. The advantage of this solution is that, at high quantities, it is possible to form and transport goods in bunches. The level between the ground floor and second floor is reserved for picking as well as preparation and labeling according to customer specifications. The work stations are supplied and goods removed by two, specially designed cable elevators, which connect the floors with one another vertically. Each elevator is equipped with a load handling device, serving as a chain conveyor designed for a payload of up to 1,000 kg. If one of these elevators fails temporarily, the pallet RBG’s automatically take over its function. Moreover elevator systems are used for vertical transport. The conveying equipment on the ground floor is also connected to the high bay warehouse by a shuttle car. A second shuttle car transfers the previously labeled order pallets to the shipping lines designed as gravity roller tracks. Each of these lines is equipped with a foot switch and indicator lights. “Red” means that the line is reserved. Upon completing an order the display turns “green”, signaling that the corresponding pallet is ready to be removed. A foot switch is available to confirm that a shipping line has been cleared completely. The shipping line can then be filled again immediately. Although frosty temperatures below freezing are not prevalent, as in the high bay warehouse for deep freeze storage, which could pose a fire hazard in combination with the low humidity, attention was nevertheless paid to fire protection. explained Ivan Jovanovic. Moreover the high degree of automation poses a certain hazard potential. For example cable fires can occur. Another possible catalyst - although rarely seen - are overheated motors in RBG’s or conveying equipment. 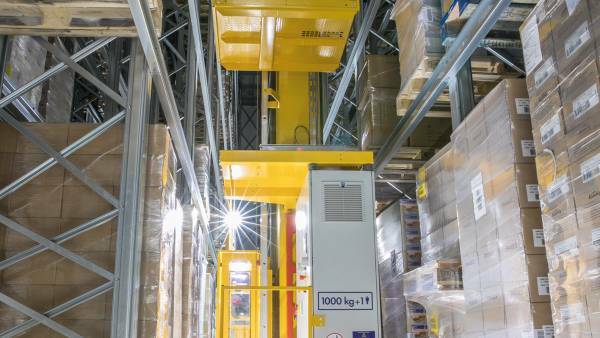 The high bay warehouse (HRL) is therefore completely inertized and climatic sluices were installed consisting of one fire protection door and one quick-opening door. This ensures that the specific climatic atmosphere is maintained and the lowest possible quantity of intertization gas escapes, because one door is always closed as a load passes through the sluice. 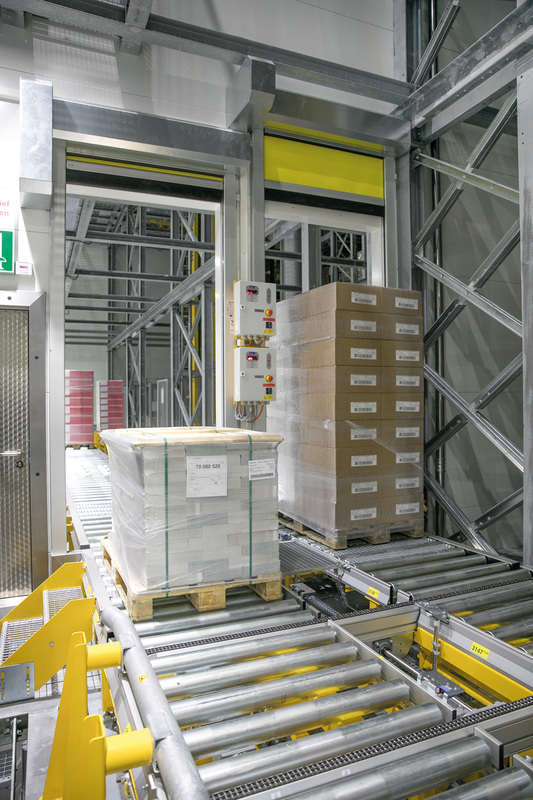 All safety relevant, technical control functions - including monitoring of the access doors to the warehouse - are stored in the MFR. Finally the Competency Center for Food and Healthcare Logistics is an important milestone within the scope of digital transformation - a path that Galliker chose years ago and continues to follow consistently.